Kurudumale was actually ‘Koodu-Malai’, a Tamil name meaning ‘meeting hill’. It is called so because this place is supposed to be a meeting place of Gods for the purpose of recreation. It’s a beautiful place with rocky hills all across and an un-attached village in between. Normally one don’t expect anything apart from ordinary in this kind of environment, but you will be surprised by the unusual sight, its a treat to your eyes. Lord Ganesh is one of the best-known and most widely worshipped deities in the Hindu pantheon. Ganesha is widely revered as the Remover of Obstacles and more generally as Lord of Beginnings and Lord of Obstacles (Vighnesha, Vighneshvara), patron of arts and sciences, and the deva of intellect and wisdom. He is honored at the beginning of rituals and ceremonies and invoked as Patron of Letters during writing sessions. This Ganesha Idol was established by the trinities (of hinduism) such as Bhrama-God of Creation, Vishnu-God of Protection, and Shiva-God of destruction in Satya Yuga to destroy the demon TRIPURASURA. Yuga is the name of an 'epoch' or 'era' within a cycle of four ages. These are the Satya Yuga (or Krita Yuga), the Treta Yuga, the Dvapara Yuga and finally the Kali Yuga. Tripurasura was an asura who tormented people, saints , sages demigods, gods in Krita or Satya yoga. He who inhabited Tripura, a mythological triplet fortress made of iron, silver and gold constructed by Mayasura. From a boon he had grown very powerful and gods could not destroy him. However his end would come from a bachelor who enters wedlock, yet lives a salebacy life! All the gods came together formed a shakthi (energy) and this shakthi became his bride. LordGanesh married shakthi in the presence of all the gods, later the skathi became his weapons. One can find these weapons being held on the either sides of Lord Ganesha in most pics. Ganesha's wife is called siddhi and Buddhi. Meanwhile Tripurasura Roams freely causing all the mayhem and chaos around the world. His end is by this Lord Ganesh! As trinity established this idol, the place came to known as kotadri, and the hill in which it is located is known as ''Kotamale'' however, over the years it became kurudumale a very rude form to say. This saligrama Ganesha Idol is the epicenter of all positive energy. This energy is omnipresent, and indestructible. This energy can create any sort of miracle. This idol is being worshipped from past four yugas. Another speciality of this idol is no matter how far you stand and view, the idol only grows bigger and bigger! Something even physicians cannot give a conclusive explanation! This is the same idol lord Rama first worshipped in treta yuga before fighting Ravana, a Rakshasa (demon). Rama emerges victorious! In Dawapara yuga, Sri Krishna worship this ganesha in order to get rid of shamantha kamaniya's curse. The spell is removed. In fact this the same temple Pandavas visited before they went on war with Kuravas, and pandavas too emerges victorious! In Kaliyuga, Krishna Devaraya of vijayanagara dynasty understands its importance. In fact lord ganesh shows up in his dreams and request for a temple built around this idol with meticulous details depicting its importance. Today one can find fine sculptures etched on the temple pillars depicting the stories of Lord Rama, and Lord Krishna. The basic belief here is anyone who comes to this temple and worship with clean heart before beginning any work; he is sure to taste success in all his endeavors! Not only it has rich mythological history to it, even today one can find a lot of paranormal activities in and around the temple. Koundanya Munni one of the sapta Rushis comes every day to this temple, and sings in praise of lord Ganesha! In fact it is believed that Koundanya rushi is still residing in the near by caves. These caves are accessible to public! This Ganesh is worship by koundanya rushi every day in the midnight. Not only Koundaniya munni but also other gods and demigods visit this place every night. People here have reported many tiny lights, have heard a lot of variety of music, prayers. ''OM'' is resonated very loudly in the nights. Also, one can find a lot of yagna kundalam! This place is very sacred. Anyone who occupies temple property, death is Guaranteed. During Rushi sapthami, many lights travel from the nearby mountain towards the temple These lights take a round about and travel back to the mountain. This happens every year and there are many witness! You may catch a glimpse of if your lucky! There is another temple dedicated to Shiva called the Someshwara temple which is also situated in Kurudumalai. The interesting thing about this temple is that it is built of a rock without any foundations. Another interesting thing is the architectural style of the temple; this temple is considered to be older than the Ganesha temple and was built during the Cholas period. Half of the temple has different style of carving, believed to have been done by artist Jakanachari and the other half is believed to have been carved by his son Dankanachari. The part of the temple supposedly built by Dankana's has statues and carvings which are more intricate and sophisticated. Ganesha temple in Kurudumale, situated on the same road as that of Someshwara temple, but here a huge Ganesha idol is being worshipped from ages unknown. 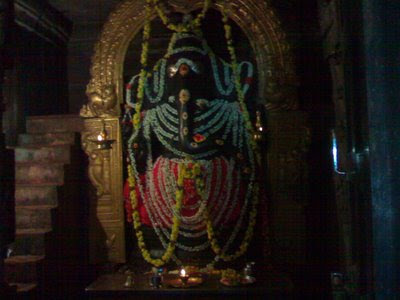 It is said that the Ganesha statue was being worshipped in an open field, until Krishnadevaraya built a temple around it. 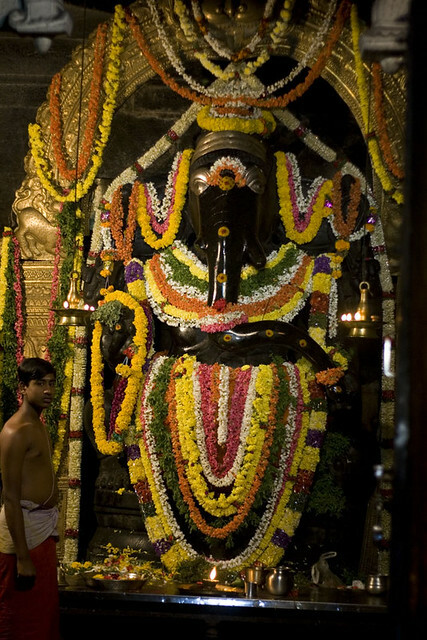 Its too huge to imagine (14 ft in all), bigger than the Dodda Ganesha of Basavanagudi.